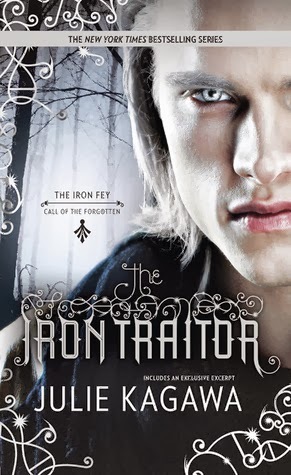 Two Chicks On Books: Blog Tour- THE IRON TRAITOR by Julie Kagawa and a Awesome Giveaway! 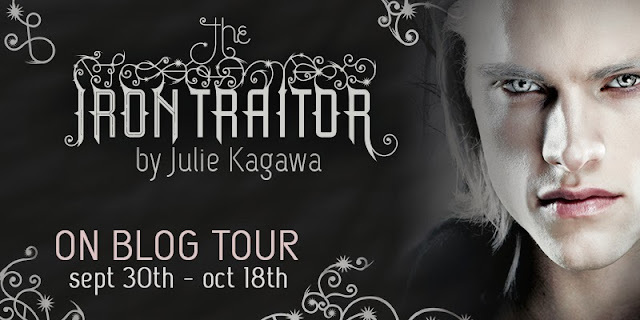 Blog Tour- THE IRON TRAITOR by Julie Kagawa and a Awesome Giveaway! Hey y’all! I’m super excited to have this stop today! I am a huuuuuuggggggeeeee fan of Julie Kagawa and her books! 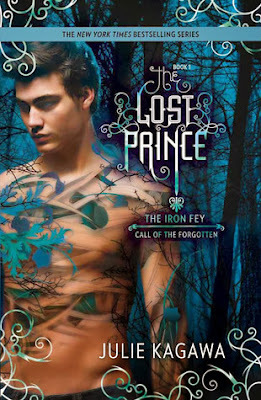 Her Iron Fey series is one of my all time favorites! So I get to ramble on about why she makes me cry in this post and Harlequin has an awesome giveaway set up. Thanks so much Kismet Book tours for setting this all up! So you’re probably wondering why I chose this topic to write about. I love a good cry IMO a book isn’t great unless I bawl like a baby. 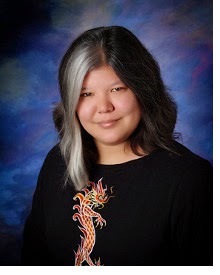 And Julie Kagawa makes me cry/bawl ugly, snotty, red eyed tears! And yes I think that’s a good thing. So why does she make me cry? Julie writes stories that I like to call emotional roller coasters. You’ll reach epic highs and epic lows and when you hit those lows you will cry. Trust me on that; and when you think you’ve cried all you can… you’ll cry some more. She has no problem maiming or killing characters you’ve grown to love, characters that have become like family or even characters that you thought you hated but realized you didn’t. Every death, every disappearance, and every frustrating scene she makes you cry. This in some form has been in every review I’ve ever written about a Julie Kagawa book. Yep while reading her books I cry a lot and while I am in total mess mode and tweeting to Julie; she teases me (actually anyone who tweets about their tears) saying “Your tears feed my muse.” And I think YES I am happy about that because feeding her muse means more amazing stories for me to cry about! I want to share a scene with you from THE LOST PRINCE that did just that made me cry and fed Julie’s muse. Scene set up Ethan has just seen Meghan for the first time in a very long time. A large metal throne stood on a dais at the end of the room, and I noticed Grimalkin sitting on a corner step, calmly washing a paw. Rolling my eyes, I looked up at the throne itself. And…there she was. Not sitting on the throne, but standing beside it, resting her fingers lightly on the arm. My sister, Meghan Chase. The Iron Queen. She looked exactly as I remembered. Even though it had been years since I’d seen her last, and back then she had been taller than me, she still had the same long pale hair, the same blue eyes. She even wore jeans and a white shirt, much like she had when she lived at home. Nothing had changed. This Meghan could be the same girl who’d rescued me from Machina’s tower, thirteen years ago. “Ethan.” Her voice, so familiar, flowed across the room and drew me forward like I was a little kid once more. Meghan smiled down at me, and any fears I had that she changed, that she was some distant faery queen, were gone in an instant. Stepping from the dais, she walked up and, without hesitation, pulled me into a tight hug. The dam broke. I hugged her back, tightly, ignoring everyone else in the room, not caring what they thought. This was Meghan, the same Meghan who had looked out for me, who’d gone into the Nevernever to bring me home. And despite my anger, despite all those dark moments when I thought I hated her, she was still my sister. This scene crushed my heart! I felt for Ethan but I know Meghan so I saw her side too. But still, their reunion was a sob fest! After his unexpected journey into the lands of the fey, Ethan Chase just wants to get back to normal. Well, as “normal” as you can be when you see faeries every day of your life. Suddenly the former loner with the bad reputation has someone to try for-his girlfriend, Kenzie. Never mind that he’s forbidden to see her again. The first giveaway is a daily one for the chance to win either a copy of THE LOST PRINCE or THE IRON TRAITOR plus a beautiful locket! 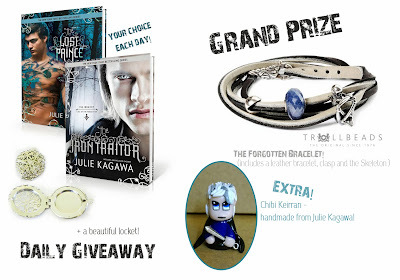 The second giveaway is for unique Trollbeads bracelet inspired by The Forgotten and a one of a kind Chibi Keirran!! Please note that both the daily and grand prize giveaways are for US/Canada participants only. See full contest rules here. I haven't read Lost Prince yet so obviously I need to get on that. But I'm REALLY looking forward to all of them! Great post, I'm extra excited to get back into Julie's word! Hi - Not sure if I'm the only having problems with the Rafflecopter, but I was able to fill out my name and address with no problems, but then it says that I need to complete a 2nd option to unlock the rest, but I don't see any other options. Is anyone else seeing this? Thanks! Yeah I just noticed that i'm letting the tour hosts know as it's not my rafflecopter. The Rafflecopter had the same problem at the Page Turners stop and I think they were going to contact the tour hosts as well. Thank you so much! I love these books. Also, thanks for looking into the rafflecopter. When it didn't work this AM I was wondering what was up. I went to see Julie at a books signing this summer and she was super nice as always! Keep up the good work Julie and don't let people bully you into doing things you don't want to do (something happened at the book signing). The wait is killing me. Thanks for the giveaway! Julie is my FAVORITE YA author. I had the pleasure of meeting her at BEA, and she was kind and gracious, even though I looked like a frazzled mess. I will read anything she writes. I love this series! I cant wait to read this! Super excited for this! I love Julie Kagawa.